Ellie and our family are so grateful for your understanding, prayers and encouragement in regard to the loss of our daughter Mary. It has been just over 5 months since her death and there are days that still really sting. Yet we are committed to healing and becoming better because of our loss. This is easier said than done. People sometimes wonder if they should bring Mary up - it is hard either way, so do what you feel is in your heart. As you know we wanted to honor Mary by doing something in her memory that would bring joy to others. We found The Common Ground Playground in Mason and did a fundraiser with a huge goal of reaching 100k. So many clients, friends, colleagues and family stepped up and gave large and small. Every gift felt like a huge act of love and brought us so much comfort. Over 130 people made gifts from 15 states, for a total of $110,000. Mason officials said they've never seen anything like it. 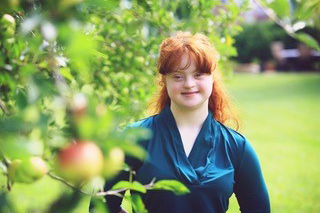 The City of Mason celebrated the life of Mary Scheeler at the February 28th city council meeting as her spirit helps connect the community in support of the Common Ground Playground. Click here to see the City of Mason's Facebook post. Thank you beyond all words. Reason to Hope, the Dayton chapter of the Alzheimer's Association, hosted a breakfast in mid in March. 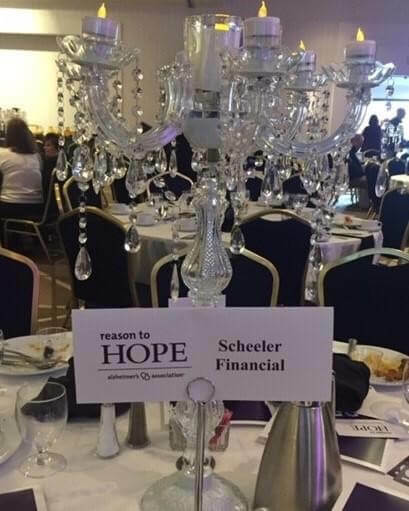 Scheeler Financial was a proud sponsor of a table at the event, as well as an attendee. Additionally, their dear friend Jennifer Loveless, who has been directly impacted by alzheimer's, MC'ed the event this year's proceedings. 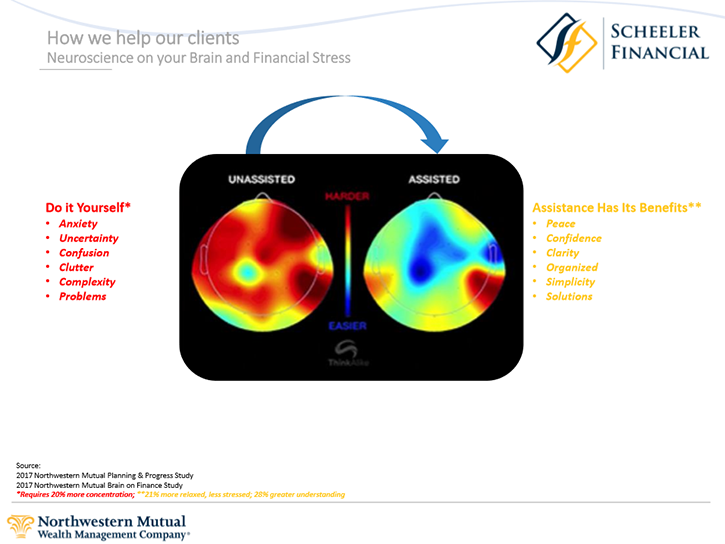 Reducing The Stress of Investing: Thinking about important financial decisions doesn't just stress people out — it actually affects their brain function. 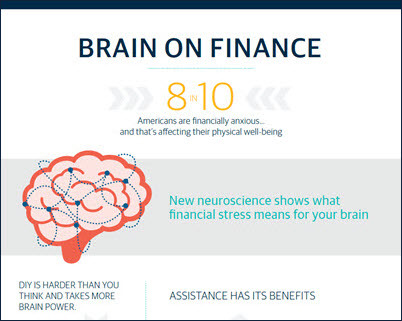 Neuroscience shows what financial stress does to the brain. The good news? When people get a little assistance while making financial decisions, their brains actually relax, concentrate and make more effective choices. Click to find out more.